Since jobs in the Athabasca Oil Sands (also known as the Athabasca Tar Sands) are based primarily on oil extraction, you will need to customize your oil and gas resume specifically for these oilfield jobs. Many of the companies that operate in Fort McMurray and the surrounding area will require you to build an online job portfolio and/or submit an electronic resume with relevant industry and job title keywords and professional accomplishments. When uploading your oil and gas resume (and possibly cover letter) to the company online website, make certain that the document is in a readable format (.pdf, .txt, .doc, or whatever the website may specify). One of the first things you need to do before applying for a job in the Athabasca Oil Sands is to conduct an in-depth job search to find sample job postings that are of interest. Oilfield companies maintain their own websites and have a section devoted entirely to different careers and positions they are hiring for. You may choose to either conduct a basic search or an advanced search on the website. A basic job search in the oilfield allows you to choose a desired Job Field and Location. An advanced job search contains parameters such as Job Type, Job Level, Schedule, Shift, Education, Amount of Travel, and so on. You can also search by Keyword. 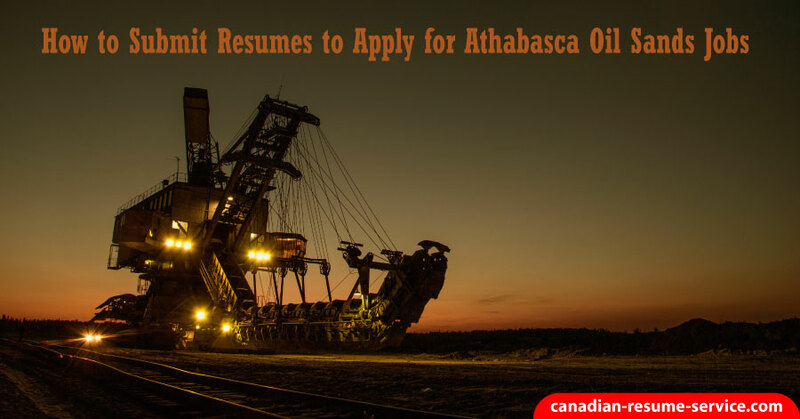 Where to Submit Your Resume to Apply for Athabasca Oil Sands Jobs? Suncor Energy– An integrated energy company that explores for, develops and produces conventional oil and natural gas, both onshore and offshore. Athabasca Oil Corporation – Focused on the sustainable development of light oil resources in Northwestern Alberta and oil sands in the Athabasca region in Northeastern Alberta. Shell – One of the largest corporations in energy exploration, which operates not only in the Athabasca Oil Sands, but internationally as well. ConocoPhillips Canada– An oil and natural gas production and exploration company, with positions that focus on technology, innovation, and sustainable development. Imperial Oil – An integrated energy company that explores for, produces, refines, and markets essential energy products. Husky Energy – An oil company that operates in Western Canada and the United States, as well as offshore, focused in the Asia Pacific and Atlantic regions. Another oil and gas website you may wish to look into is Rig Zone. Rig Zone allows you to search by various parameters such as the ones listed above. You can limit your job search to positions in the Athabasca Oil Sands, or you may want to expand across Canada, or even across the globe. As an oil and gas resume writer, my clients have had excellent success using the targeted resume and cover letter we create to get results. After you have narrowed down the type of job you wish to target, you will need to fill out an online application. More often than not, you will be asked to build a personal job account first. Once your personal profile/account has been set up, you can start applying for positions. Enter your contact information (name, address, home phone/cell phone number, email address), upload a keyword rich oil and gas targeted resume in the correct format, and select the highest level of education you have earned. Continue with providing the details of your work experience, click off relevant skills, select when and where you want to work, etc. The order of these steps and applying can vary depending on the company, and not all may be required. Be prepared to spend 30-90 minutes completing the online application, with many of the steps seeming repetitious of the information you provided in your resume. Note: to ensure your session does not time out while you are building your oilfield applicant profile, have your resume ready ahead of time. Learn how to write an excellent oil and gas resume to ensure your application is read. If you need help writing your resume connect with me via email – candoco@telus.net or call toll-free 1 877 738-8052. Having your resume available will allow you to copy and paste from a text formatted document into the fields listed online. When you copy and paste from an ASCII Text format, the resume will not look scrambled or messed up. Make sure you triple check details and proofread your resume before entering your information online! Your goal is to use your online portfolio now and professional oil and gas resume to communicate you meet and/or exceed the organization’s requirements, and will be an asset to the company. Furthermore, by utilizing industry buzzwords in your resume and cover letter, you will enable the online filter (or Applicant Tracking System) to pick up on your profile; thus putting you ahead of the other applicants. The key phrases you could use in your resume need to be relevant to the job target also known as your career focus. I just listed a few to provide an idea. These oil and gas work skills and areas of expertise should also be highlighted in your oilfield cover letter, demonstrating you are a dedicated and driven individual. Once you have submitted your required documents, you will need to wait for a phone call or emailed response from the company you applied with. However, use this opportunity to be proactive and aggressive in the job search. Apply for more than one job with more than one company, ensuring you have a better chance of landing a job in the Athabasca Oil Sands. Depending on the company, you may be required to attend an in-person interview or conduct one over the phone. A job posting could ask for a curriculum vitae (CV), not a resume, in Canada it would usually be a resume. Read about the difference between a CV and resume. Find a quiet location you can be alone to conduct the interview. Minimize distractions such as television, computers, phones, pets, children, etc. Dress as if you are attending the interview in person, ensuring you will still act professionally on the phone. Use appropriate language. Even though your interview is over the phone, and you may never meet the interviewer face-to-face, you must still conduct yourself accordingly. Every negative word or uneven tone you take will be noted and could cost you the position. Keep a copy of your resume and cover letter in front of you to refer to. The interviewer may ask you specific questions that pertain to your job application documents. They also act as handy crib notes if you are a bit nervous during the interview. Practice and prepare before your interview! Over the last 16 years, I have helped many clients in the oil and gas sector, not just by writing their resume and cover letter but by providing job search coaching or interview preparation assistance. Show up early for your oil field job interview. Drive the route ahead of time and allow for any unforeseen events, such as road construction or traffic congestion. Dress in business casual attire, ensuring your clothing is clean, pressed, and well put together. Shake your interviewer’s hand at the end and beginning of your interview, thanking him or her for the opportunity. Maintain good eye contact, but don’t stare. Remember to smile. Again, practice, practice and prepare for your oil and gas industry interview! After you pass the interview stage, you could be asked to undergo a drug screening, ensuring you are a drug-free individual. Most organizations also hold drug-screening tests on a regular basis to make certain that their employees are able to be productive and efficient workers, who will not be a liability to the company and its stakeholders. If you would like extra guidance and help writing your oil and gas resume / CV, cover letter, LinkedIn profile, or preparing for the job interview, contact Canadian Resume Writing Service right away! Ask yourself this question: is your resume grabbing attention for the right reasons? If the answer is no, it’s time to take a different approach to prepare your resume for the oil and gas sector. Landing job interviews will be determined by the strength of your resume. You can review our oil and gas resume sample. If you found these tips on how to apply for Athabasca oil sands jobs valuable, I would appreciate you sharing this post with others!